3LAB's Guide to Luxury Living: In Style Magazine LOVES 3LAB Super "h" Serum - soon to hit the UK beauty counters!!! 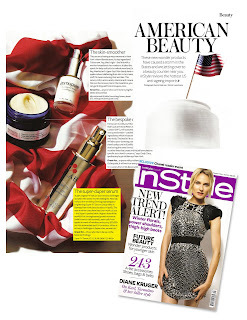 In Style Magazine LOVES 3LAB Super "h" Serum - soon to hit the UK beauty counters!!! 3LAB's original "h" Serum stormed into Selfridges last year with a two-month waiting list. Now say hello to the revved-up firming, hydrating and brightening Suer "h" Serum (a top sellert in Barneys New York since its debut in April). The men in white coats have had their work cut out - the Super is packed with a higher dose of teh wolrd's first bioengineered growth homonre (which boosts cell renewal), stem cells from apples to ward off wrinkles nda a pricy $20,000 per kilo antioxidant and UV-protector. When it arrives in Selfridges in September, we want in! Great for...those who like to be up on the latest technology. Super "h" Serum, GBP215, 3LAB (0800 123 400"